Photo thanks to @anggerwitasari on Twitter. 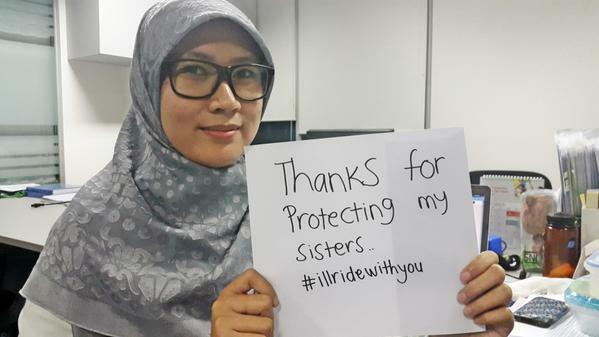 This is a short one where we give our take on the Sydney Siege and the #illridewithyou campaign. This includes discussion on some of the inaccurate media coverage on the siege and how happy we are to see widespread opposition to the Islamophobic reactions. We also play an interview with counter-terrorism expert Dr Anne-Azza Aly from People Against Violent Extremism. This interview is thanks to Alex Whisson and Perth Indymedia on RTR92.1FM. For more of our coverage opposing Islamophobia, check out our 69th and 70th episodes. The Unseen ‘Force Fed’, Interview with Dr Anne-Azza Aly from Perth Indymedia on RTR92.1FM, Anti-Flag ‘9/11 for Peace’. You can listen to a short (9 minute) version of this episode, which features our opening discussion on the siege and the #illridewithyou campaign, here: I’ll Ride With You. You can subscribe to these short versions of our episodes through Omny. Thank you for this great campaign & idea! Great to hear and thanks for the feedback!